Halftime shows are a tradition during American football games. Entertainment during the Super Bowl, the annual championship game of the National Football League helps broaden the television audience and nationwide interest. During most of the Super Bowl's first decade, the halftime show featured a college marching band. The show's second decade featured a more varied show, often featuring drill teams and other performance ensembles. The middle of the third decade saw the introduction of popular music acts such as New Kids on the Block, Gloria Estefan, Michael Jackson, Clint Black, Patti LaBelle, and Tony Bennett. Starting with Super Bowl XXXII, commercial sponsors presented the halftime show. In the six years after Super Bowl XXXVIII, all of the halftime shows consisted of a performance by one artist or group, with the musicians in that era. These shows were considered "family friendly" and the time in which they took place has been described as "the age of reactionary halftime shows". The replacement comes weeks after Gaga's critically acclaimed Super Bowl LI halftime performance. For performing on top of NRG Stadium, Gaga was accompanied by a fleet of 300 synchronized, LED-equipped "Shooting Star" drones, which formed an image of an American flag behind the singer. It marked the first time that the drones had been used as part of a television broadcast. The New Yorker described Gaga's performance as "an astute, intense, and disciplined performance". 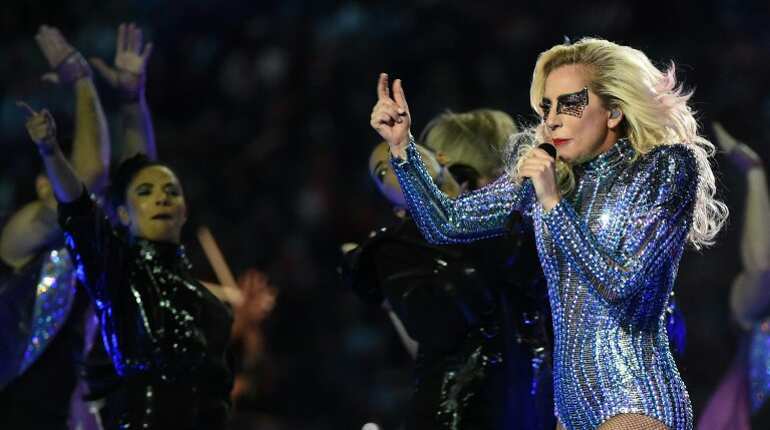 Though the singer?s performance may not have gotten as political as Beyonce?s Black Panther-inspired halftime show last year, it was clear that Gaga was sending a message by singing ?Born This Way,? which has become an LGBTQ anthem since its release. Gaga switched her outfit in lightning speed, changing into a white football-inspired top and silver sequined boy shorts to jump back on stage to sing ?Bad Romance.? Two years ago, an extra 7 million viewers--or a total of 118.5 million people--tuned in to watch Katy Perry and Missy Elliott perform. After last year?s performance, Coldplay saw sales of its collective discography jump 365% in the U.S. Bruno Mars and Beyonc?, who joined Coldplay, saw sales jump 80% and 31%, respectively. There were 2.2 million tweets about the #PepsiHalftime show during the 20-minute live performance. There were 5.1 million tweets about #Gaga's performance, and Lady Gaga was mentioned on Twitter 2.1 million times between 7:50 and 8:40 p.m. EST. Last year, the halftime show garnered 3.9 million tweets, according to data from Twitter. Viewers tweeted about Beyonc? 1.3 times, Coldplay 774,000 times and Bruno Mars 341,000 times, all in the 23 minute time period.